was just a little too tight. 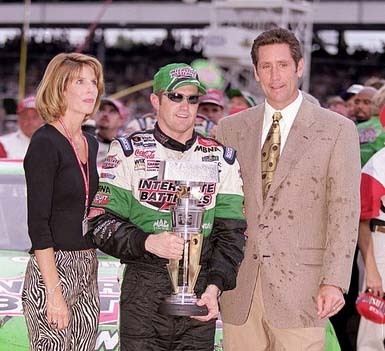 "To beat a great driver like Rusty Wallace, it's awesome,"
those bricks they're Hoosier bricks." "It's definitely a thrill. We've been close a couple of times. the final pass, he said "That last set of tires was just too tight. long. Man it was flying." a good race team. We've accomplished a lot." two races ago at New Hampshire. races, from 29th to 25th. "We had the best pit crew today. They couldn't do anything wrong." ourselves, but when I got around other cars, we got tight. a better place to get a top-five finish right now." ** Bodine was fast qualifier, but speed was obtained on the second day of qualifying. around six guys on the first lap or two." fast as they were. That's all there was to it." tires we were pretty much going to fish where we were at. 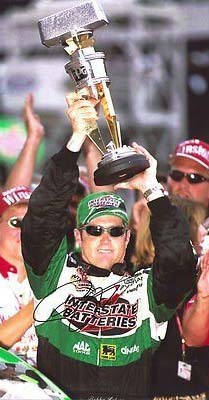 as to where Bobby(Labonte) was." finished sixth, earning the Exide Batteries "All Charged Up"
got a handle on the handling, but we did the b! est we could." just wasn't our day." He finished 21st, one lap down. DW's last race and that all th! at matters." had on this track in the Indianapolis 500. "It was awesome. be careful...it was an accident." sustained some damage, but were able to continue. hurt, and no other cars were involved. Speedway's road course, on September 24. 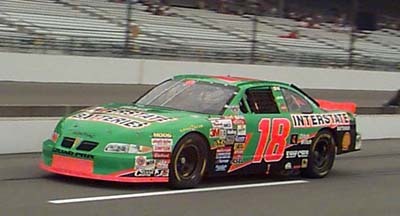 Labonte went on to win the Winston Cup Championship!